I did this 8-mile walk recently on a long summer afternoon as the day’s rain showers cleared away. I found it a good route for enjoying the variety of the landscape in this corner of Shropshire, from green valleys to moorland. The circuit begins with a riverside path and climbs to traverse the rolling skyline of the Long Mynd, with marvellous views. 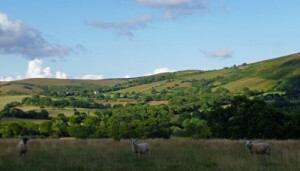 The final stage crosses the green farmland of Adstone Hill. It’s a fairly easy walk; the gradual climb from Ratlinghope to the Long Mynd is the only time you might get out of breath. 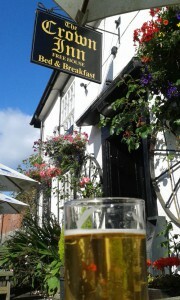 There is a pub at the beginning of the walk and another in the village of Wentnor, towards the end. 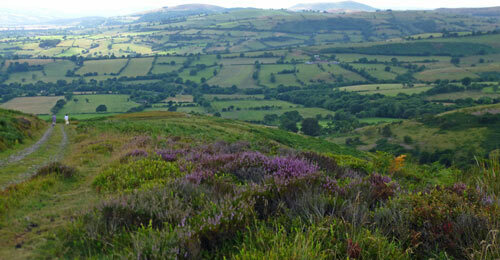 It’s a good idea to take a packed lunch to eat on the Long Mynd. In summer, you might want to take a plastic box to collect bilberries/whinberries. With stops for a packed lunch, foraging, exploring and a pub drink, it took me something over six hours. The area is covered by the Ordnance Survey Explorer Map 217. Photographs and a plotted map of the route can be found at the foot of the page. 1. Bridges to the Long Mynd. The walk description starts at the Horseshoe Inn at Bridges (‘The Bridges’), Ratlinghope, where there is a car park and a bus stop for the Shropshire Hills Shuttle Bus. As it is a circular walk, of course, you can begin where you choose. From Bridges take the road leading to Ratlinghope. This passes Bridges YHA. When you come to a footpath sign on your left, leave the road. Follow this attractive riverside footpath until a signposted path junction. Turn right, crossing the stream and heading across the field ahead, to the left of Manor Farm. The path rejoins the road opposite the Manor, a dilapidated building which is for sale at the time of writing, and hoping for a sympathetic restoration. Turn left down the road. Soon you’ll come to a side-turning on the right. This is the route to follow up to the Long Mynd. If you want to make a detour to visit Ratlinghope church, continue a short distance down the road you were on, before retracing your steps to this point. Climbing the narrow road between fields, don’t omit to look back at the view behind you. Part of the way through the ascent, leave the road when you come to a footpath sign on your left. Follow this footpath, keeping to the right of the buildings. After passing a cottage, the path emerges onto the edge of the Long Mynd. Skirting the area which the map gives the romantic label ‘Wild Moor’, follow the clearly-defined path through bracken and heather. In July and August there are good grounds here for picking whinberries/bilberries. This way isn’t heavily trodden, and you might see some interesting wildlife including little birds starting up from the heather. The footpath finally rejoins the road from Ratlinghope. Continue along the road, passing a car park and tumulus on the left (once the site of a shooting box, which is still labelled on maps). Shortly after these landmarks, take the second path on your right. A wide track which is currently surfaced in ugly grey grit, this bridle path is popular with cyclists as well as walkers, and should be signposted to Pole Bank. 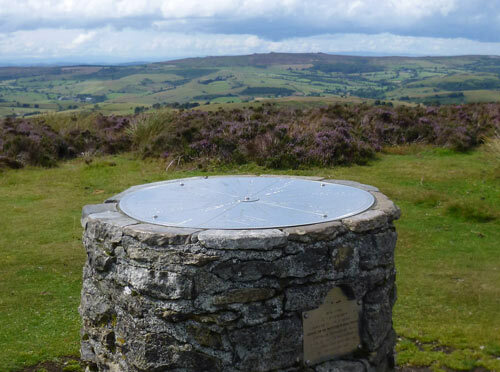 Ascending gently to Pole Bank, the highest point on the Long Mynd (516m), you will get wonderful views across the Shropshire Hills Area of Outstanding Natural Beauty and as far as the Malvern Hills and Wales. The panorama from Pole Bank must be very hard to beat, anywhere in England. 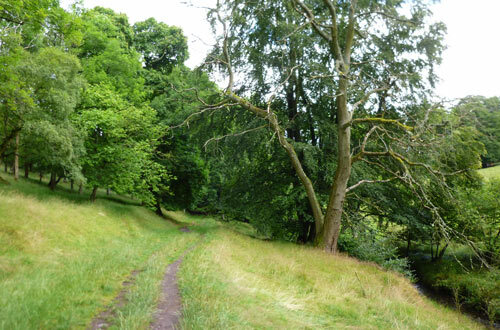 After a break to admire the view or eat a picnic, continue on the bridlepath – the old Portway – as it descends. 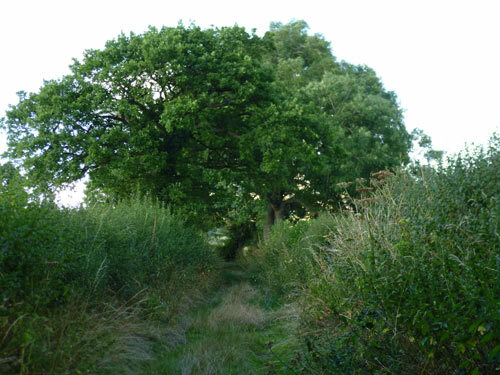 Rejoining a road, follow it past an old field enclosure still protected by trees, called Pole Cottage on the map. Afterwards, take a path heading diagonally to the right. (Behind the enclosure are ponds and a tumulus, which you might be able to see to your right). The path heads down from the spine of the Long Mynd ridge. As it reaches the edge of the heather-covered upland, your path drops to the right, descending into a short valley. Right at the edge of the moor is the picturesque Upper Stanbatch Cottage (which is available as a holiday let). Follow the cottage’s access lane downhill through the bracken. You’ll emerge onto the road by the equally picturesque Stanbatch Cottage. Cross the road and climb over a stile into a field. The first few yards here, through a copse by a stream, may be wet. Follow the path along the field’s edge. After passing three cottages facing onto a field, you’ll emerge onto another country road. Follow this to the left for a short distance, until you come to a footpath sign pointing down a lane on the right. Follow this lane, past a ruinous abandoned farmyard and a secretive dwelling. Through a gate, continue up the field ahead. The footpath emerges on a road with hedges each side on top of a low ridge. You can cut the walk short by turning right here and heading along Adstone Hill. 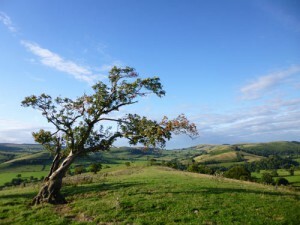 The longer route makes a looping detour to visit Wentnor, with the option of a pub stop. To continue to Wentnor, turn left and walk along the road into the village. Don’t miss the painted decorations on the roadside on the right. The Crown Inn, on your right, makes a good pub stop for drinks or food. (Read more about Wentnor). Before leaving Wentnor you may wish to visit the church, which lies a few yards down the road beyond the pub. To continue the walk, take the lane heading behind the pub on the right-hand side of the building. This leads into a field, where you turn left and walk along the hedge. This footpath emerges on a road by the rather wonderful sign ‘Dangerous Hill’. Head through a gateway on the far side of the road which opens onto a green lane. Following this track, and then keeping left in the field beyond, you’ll emerge back onto the Wentnor road right by the spot where you joined it at the start of this loop. This time turn right and follow the lane leading straight along the ridge, slightly uphill. Look out for the rich variety of plants, including honeysuckle, in the hedgerows here. The next stretch is a long uphill, but at a reasonable gradient. You leave the lane where it takes a right turn. Follow the footpath sign and head through the gate onto a track that continues the ascent up the spine of the hill. 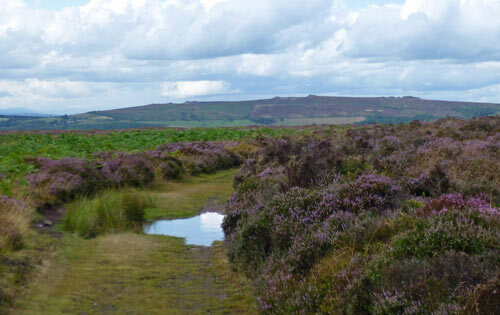 This old route continues right along Adstone hill, and where the scenery opens out, at the ridge’s highest point, there are some wonderful views, from the Long Mynd to the Stiperstones and beyond. Continue to follow the path along the ridge until it drops at the far end, heading down somewhat to the left. Heading through a gate, you’ll find yourself on a steep and narrow road. Follow this downhill past a couple of fairy-tale cottages, until you reach Bridges, the end of the walk and perhaps a welcome ale.